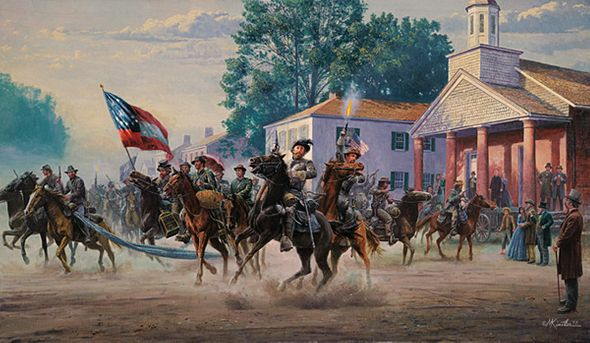 Mort Kunstler Limited Edition Artist Proof Print:"Morgan's Ohio Raid"
Image size: 16 3/4 " x 29 "
About the Print: It was one of the boldest cavalry operations of the Civil War. In July of 1863, General John Hunt Morgan led 2,500 Confederate cavalrymen on a daring, three-week raid through Indiana and Ohio. Morgan and his men eluded pursuing Federal cavalry, diverted Federal troops and resources and delayed important Northern military operations. In the beleaguered South, news of Morgan's Raid boosted morale. Morgan and his cavalrymen were relentlessly pursued by determined Federal cavalry commanded by Generals Edward H. Hobson and Henry M. Judah. They met staunch resistance by Midwestern civilians throughout the length of their raid. In Montgomery, Ohio - a village near Cincinnatti - Morgan's Raiders received a chilly reception from defiant townspeople. With Northern forces closing in, Morgan's harried troops pushed on across Ohio. Five days after Morgan's men entered Montgomery, Hobson's and Judah's Federal troops overtook the Rebel raiders at Buffington Island, Ohio and captured approximately 700 Southern soldiers. Morgan and his men raced northward, but were finally cornered in northeastern Ohio near the Pennsylvania border. There, on July 26, 1863, Morgan was forced to surrender his command near West Point, Ohio - barely 70 miles from Lake Erie. Although Morgan would daringly escape from imprisonment and return to Confederate command, he would be mortally wounded on another raid. In the South, his exploits would become part of the legacy of the Lost Cause. In Ohio, generations to come would recall the days when the citizens of the Buckeye State defied the Rebel Raiders in the alarming time of Morgan's Ohio Raid. This painting began with a phone call. 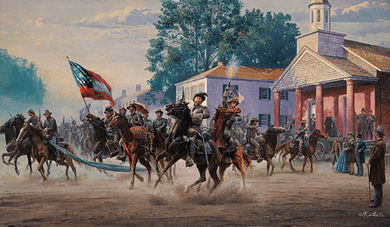 It was from Darrell Markijohn of the Ohio Bicentennial Commission, who called to inquire if I would be interested in being commissioned to do a painting of General John Hunt Morgan's 1863 raid into Ohio. Morgan and his raids had intrigued me for years, so I decided to investigate the subject. It proved to be a fascinating chapter in the history of the Civil War. I consulted with Morgan authority Lester Horwitz, author of The Longest Raid of the Civil War, and learned that Gen. Morgan and his Southern troops conducted an extraordinary cavalry operation in 1863. It covered more than 1,000 miles through four states, and finally ended in Ohio. It was a daring raid, and was opposed in various parts of Ohio by valiant Buckeye defenders. I joined Mr. Markijohn and Mr. Horwitz for a tour of historic sites on the route of the raid, and after a couple of days studying locations we came to Montgomery, Ohio. Although it's now a suburb of Cincinnati, Montgomery was a small rural town during the Civil War. Morgan's raid on the town in 1863 is well-documented, and many of the period structures still remain. I was impressed with the 19th century charm of the Universalist Church on Montgomery and Remington Roads. Its appearance remains much as it was during Morgan's raid. One look at this corner and the picturesque church building, and I knew I had found the location for my Morgan painting. All the actions you see here were duly documented and recorded in letters, diaries, and newspaper articles. The raiders were mostly kids on a "hell bent for leather ride." It was the adventure of their lives, "hootin' and hollering" the whole way through Ohio. Although vandalism was prevalent on the raid, there was no wanton pillaging, burning or deliberate harm done to the citizenry. Early in the morning of July 14, 1863, Morgan's Raiders entered town from the south on Montgomery Road, and turned east into the rising sun onto Remington Road. They proudly carried the first national flag of the Confederacy and the Kentucky state flag. The Ohio state flag flies from an open window in the distance and the "Stars and Stripes" is being defiantly unfurled by a woman in the window of the center building. General Morgan is seen in the center of the painting - mounted on his big bay horse, Glencoe, his revolver in hand and wearing a plumed hat. Directly behind him is his brother-in-law, Colonel Basil W. Duke, who is firing in the air to chase a determined and stoic citizen off the road. All the other faces of the Confederates are based on existing photographs of the men, some of which were taken in prison after their capture. In addition to Daryl Markijohn and Lester Horwitz, I would like to thank Mary Lu Rose of the Montgomery Landmark Commission for all her help. Recreating this event as a painting was very enjoyable for me. It represents the courage and determination of Americans on both sides of the remarkable conflict and commemorates an important event in Ohio's history.